Tauna’s guide is excellent, but gives dated character advice, which I’ll be rectifying here. The Defenders: Daredevil, Iron Fist, Jessica Jones, and Luke Cage. Punisher rounds out the team. Their portraits are in the order you should have them arranged in your team in-game, left to right. Subsequent teams will be arranged in the same way. Why The Defenders? They’re a team with strong synergies and powerful in many game modes, including arena, blitz, and raids. You can farm each of them, they’re available early on, they use a good spread of currencies (Daredevil is acquired with arena credits, Luke Cage with blitz credits, and the other 3 with campaign energy). They are also all City Heroes, qualifying for the Block Party event (which gets you valuable ability materials). They’re so far and away the best choice for a new player to focus on first that there isn’t any debate about it, and instead I’m going to focus on the second and third team choices. Early on, you’ll want to pick a Villain team as well for the Villain campaign. Now important context: you’ll eventually need the following teams in the short-term: Cosmic, Mystic, and Mercenary, besides the teams you’ll need for challenges. Now, notice that I say guaranteed. And I listed 6 characters! What is wrong with me? We don’t have time for that, so let’s talk about the other two. Frankly, Elektra should be dropped from the team, as she’s a mediocre character at best when outside of an all-Hand team. I included her as an option because she doesn’t cost a valuable currency like Mordo does (arena) and a lot of players swear by her. I think they’re wrong and holding on to her for the nostalgia factor like a childhood blankie, but I digress. If you’re following this guide well, you’ll place high enough in blitz to unlock around eight characters through the blitz rank and milestone rewards that you wouldn’t otherwise have access to. For me, one of those was Loki, and he immediately went into my Villain team. The list will change over time, but if you snag Loki, Thanos, Korath, Kingpin, or Hand Sentry (among other options), they should go right in. If you haven’t already dropped Elektra, you should drop her for a character you obtain from blitzes. After that it’s arguable, but I’d lean towards Mordo, unless you got a Cosmic & Mystic(C&M) character like Loki or Thanos. If you get a C&M character, drop one of the Mercs that fill a similar role. In other words, if you can go heavy into C&M characters, you want to do that. The Hand is another option to focus on farming, but I don’t think it’s as strong of a choice. Nobu, the best character in The Hand, isn’t farmable at all and Assassin isn’t farmable until much later. This means you have to include Hand Sentry in your team, who requires precious raid currency. You can do this, but I think the currency is better spent on gear and the Hand in general don’t bring as many useful traits, like Cosmic. They also aren’t as good in challenges as they rely on team synergy a lot. Or your third team, for the less cultured among you. Like your option for the Villain campaign, your third team to focus on is debated as well. An important caveat – you shouldn’t be putting any resources into your third team for the first few months, except to set them up for Blitz (see Blitz section below) and maybe farming their shards (if they’re from energy and it doesn’t hurt your gear progression too much). Critically, they unlock one of the best characters in the game: Nick Fury. Nick Fury (NF) is the key component in the best overall team in the game right now, pairing him with 4 SHIELD minions (the brotherhood theoretically beats out NF + SHIELD in arena, but the brotherhood are near useless in raids and require heavy whaling to acquire due to not being farmable). Now the second best choice is to go for unlocking Star-Lord (SL) instead via Rocket / Ravager Boomer / Gamora / Drax / Yondu. The advantages of the SL strategy are that it has less total characters to gear (not counting Crossbones & Yondu) and that it has less characters that you’re going to shelve (You’re going to put Kree Oracle and Kree Royal Guard into retirement right away, while only Ravager Boomer is bad). Gamora, Rocket, and Drax are also a notch above the remaining 3 Kree minions. Further, there are Guardian/Ravager specialized raid nodes in some raids (but not all). But I think those advantages are deceptive. While you’re gearing less total characters, you’ll be spending more gear on them in the long run. Since you stop gearing the Kree as soon as you unlock NF, that’s a big gear burden you don’t have to deal with anymore – while with the SL strategy, you have to keep gearing everyone for them to continue to be useful. If you instead stop gearing Drax / Gamora, their advantages over the Kree minions matters much less since they won’t be powerful enough to matter in the long run. Further, it will be a long time before you get your Guardian/Ravager team up to standard in order to do raid nodes. At one month into the game, my second team (Villains) wasn’t far enough to be useful (~50k power), let alone my third. At two months in, I could be that far, but instead I’ve invested that into my top two teams. Right now, there aren’t Guardian/Ravager specialized nodes in a raid anyways. On top of this, only a handful of people per alliance need to handle those raid nodes. Not everyone has to have those squads. Additionally, the ideal Starlord team wants access to two characters that are unfarmable to new players: Thanos and Vision. You’re going to have to spend money or wait a very long time to access to the ideal Starlord team, whereas the ideal Nick Fury team is farmable very early on. These advantages combine to mean the NF strategy will have a noticeable gear advantage: fewer characters to gear and more gear to go between them. The NF strategy also unlocks Iron Man, another high-power character. Okay, so an important caveat to the above. As you can, you should get five mercs starred up so you can get the bonus gold from the mercenary event. You can probably get the 1-star level unlocked in your first month, and slowly go up from there. Only equip the minimum gear needed and level up as little as possible to do the events, and nothing more. Don’t bother to get one character way ahead of the others in shards – they all need to reach a new star level to unlock a new tier of the mercenary event. I recommend Deadpool, Bullseye, Korath, Merc LT, and Merc Riot Guard. Hopefully by the time you get to this point Deadpool is farmable. Merc Sniper is a passable substitute until you get Deadpool, but should be avoided if possible. Plan out your energy spends. If you’re following so far, get shards for the Defenders, your villain team, Kree minions, and your Mercenaries. Do every 50 power core refresh per day and that’s it. Rotate arena currency between your characters one star at a time, i.e. finish one star then go get a star on another character (hopefully just Daredevil and one more, like Mordo). Blitz currency should always go to blitz orbs. Raid currency should go to gear. Gold should be split between buying gear from supplies and leveling characters. In about a month, read the bible again. If you follow it well and model your characters the way I told you, should be able to reliably unlock ~8ish characters in the month-long newbie bracket. Once out of the newbie bracket, you should be at just about enough points to complete every milestone, and placing in the top 25% in the normal (i.e. non-newbie) bracket. If you’re willing to spend money, I highly recommend the $10 starter pack that contains either Captain America or Deadpool (you’ll get offered one or the other, not both). Both are stellar characters throughout the leveling process and in many of the game modes. They’ll fill in your Heroes team until you get your ideal team going and serve you well afterwards. Another common early option is Kingpin – not as good, but the next best choice if you want to spend more money. If you snag Kingpin, your Villian team should look like: Kingpin / Yondu / Crossbones / Mordo and one of the Mercs. Ideally from blitz you’ll snag a summoner character like Loki or a character with a strong AoE like Thanos to take the last slot over the merc. Other than that just about nothing is worth the money. And that wraps up my Marvel Strike guide for new players to get a quick start. Disagree? Tips I missed? Comment below! I have been enjoying Galaxy of Heroes for over a year, logging in nearly every day of that year. Being a gamer that loves tactical/strategy games, GoH held a lot of promise from the very beginning. It seemed to be a game that focused on awesome tactical combat with characters I actually liked (sorry, Final Fantasy). Unfortunately, Galaxy of Heroes is not a strategy game. Games are about providing players meaningful choice. Experiences should be enjoyable in and of themselves. You should *want* to play the game. In most games you have resources to manage, whether implicit or explicit. Strategy games are about these choices on a macro level, while tactical games are about making choices on a micro level. Galaxy of Heroes does not deliver this kind of experience. The only gameplay that most people enjoy are raids or Arena (but often not both), and in some uncommon circumstances, Galactic War. This part is obvious, but it points to an important realization. GoH demands a large share of your time and attention in order to play the vanishingly small parts of the game that you want to. It even charges you to skip the parts of the game that *aren’t* fun. Further, GoH has made significant strides, intentional and unintentional, to diminish choice. Look at how GoH handles raids. Part of the fun is exploring raids and trying to find atypical strategies to win them. Instead, unusual strategies are patched out – quickly. Critically, this shows that the team has bandwidth to fix what they determine to be bugs. But their highest priority is to slow the player base down. In other words, they view GoH as a treadmill. And they’re trying to keep us all on it. Arena is a dismal failure. We’re back to the one-team solution. In a game where you have hundreds of characters, a single team should not be the only dominant, “correct” solution. But thanks to the power disparities between characters, poor AI, and other factors, we’ve got a metagame where there’s a single correct choice. Yes, you can make other teams work. But you’re intentionally using a weaker team for your own motivations – that’s not the same thing as providing the players with an interesting choice. I argue that if we were given competent AI, or even live PvP, the metagame would settle on one team. The antithesis of choice. Yes, there was a time recently that there was good diversity. However, I’d argue that this was because of the limited availability of the best characters – now that they’re commonplace, the meta has settled in. There haven’t been significant balance changes or new meta-defining characters since November (except Darth Nihilus, and to a lesser extent, R2D2). More importantly, you see that GoH isn’t interested in fixing this problem. It’s clear to anyone that competes in arena that the health of the arena metagame isn’t a concern. The metagame is long stale. There isn’t even an acknowledgement that this is an issue. And I suspect that’s not just a failing of communication (which I could write another full post about). I would guess that GoH is okay with a boring arena metagame. To be clear, I am *not* criticizing players that enjoy the collection aspect of games. Nor am I hating on players that love the gambling aspects of games. I understand that drive and desire. If all you want is a collectible game to unlock the characters you love, good on you. Keep enjoying the game. But that’s not the only game that Galaxy of Heroes pitches itself as. The game that GoH has failed to deliver. Admittedly with the new update they’ve announced, GoH could right the ship. It could be going in the right direction. I would love nothing more. But I doubt it. It’s more likely that the new game mode is going to have limited play-time. Have little meaningful choice. Not deliver an experience that you enjoy for the experience itself. And until that day comes, I’m not interested in playing anymore. Thanks for the good times. R2D2 is one of the four event characters. Out of all of them is the most plug-n-play. It can fit it just about every team thanks to its versatile support kit. Critically, R2D2 is durable and brings a wide array of tricks. Including multiple of the staple needs, such as cleanse and a psuedo-taunt, as well as some unique ones, like a targeted taunt and burning, make R2D2 a fantastic addition to most teams. R2D2’s passive stat boosts only further its appeal. R2D2 effectively brings a taunt to the team. More notably, this taunt can affect any character. This is fantastic with characters that want to be hit, like Kylo Ren. Its passive cleanse is another strong addition, but this is a staple for just about every team to have. It’s important to note that it only works with Light Side characters, but that still provides a lot of options for you. The Burning debuff is unfortunately overhyped. While it is still a useful tool, it shouldn’t be something relied on. Today’s meta is cleanse-heavy, and while negating dodges is a nice trick, it’s not the silver bullet to Maul teams it was expected to be. Characters under a Maul lead can still end up in Stealth from Maul’s lead (if they’re crit) or Savage can cleanse them of the Burning debuff. You have a lot of flexibility in how to mod R2D2. Speed is of course great, but let’s move past that. R2D2 is durable enough that most people won’t try to focus the droid down first. That being said, you want enough survivability to ensure that it’s a bad idea to focus R2D2. From there, you can either focus the aforementioned speed. Or you can do more survivability, and use R2D2’s psuedo-taunt on itself. Or you can do damage – the droid does a surprisingly good amount of damage, especially for a taunter. Potency doesn’t hurt either, as long as it’s not overkill. R2D2 relies heavily on two mechanics: buffs and debuffs. In the case of the former, a lot of its utility is in the shape of its mass stealth ability. Bring Buff Immunity to shut this down. Failing that, look for mass-dispels. B2 brings both of these abilities, and B2 seems a fitting counter to R2D2. With regards to its debuffs, you can shut those down through the normal mechanics. Tenacity Up is great if you can get it up first. Cleanse if not. Both is best. Your normal culprits, like Chirrut, GK, and Rex all fit the bill. General Kenobi is the second raid-exclusive character and thankfully actually worth the farm. (Sorry raid Han) He may be classified as a support, but brings strong damage and tank functionality too. General Kenobi is one of the best characters in the current metagame, and may be the best plug-and-play character (It’s a close race with Darth Nihilus). He brings a team-wide cleanse, great buffing, an auto-taunt, and strong burst damage all on a bulky frame. Jedi and Clone allies gain 30% Max Health and 70% Defense. After a Jedi ally uses a team healing Special ability, all other allies at full health are called to Assist, dealing 50% less damage. When a Clone ally uses a Special ability they gain a buff (Attacker: Advantage, Support: Stealth, Tank: Taunt) for 1 turn. Technically you can use Kenobi as a lead. But just because you can doesn’t mean you should. Admittedly if you have no TM-boosting leader, Kenobi is probably your best choice. But if you’ve gotten far enough to unlock GK and don’t have another leader you’ve already fucked up. This is where GK shines. His amazing kit and versatility makes him worth a slot on any team. Every team wants a cleanser, taunter, and more damage, and GK brings all three of these with a bow on top. Normally I’d talk about what needs you’re looking to fill that you should cover with GK. But really, when looking to fill a slot, GK is the measuring stick that you should compare against. Any other character has to bring more to the team with their unique synergies to be worth it over GK. GK is simply reliably good. When it comes to synergies, it’s not how you can help GK, it’s how GK can help you. Okay, that’s not entirely true. GK really wants his auto-taunt and auto-foresight to work, and would prefer not have to use his cleanse. So pairing him with another cleanser (or two, if you’re particularly sadistic) makes GK shine. With regards to other characters, everyone appreciates a good cleanse. His team-wide Retribution means that you should look to pair him with characters with strong basic attacks. His team-wide assist chain only furthers this synergy. Technically you could argue that GK also has a synergy protecting weaker characters with his Foresight-granting abilities. But basically every character benefits from Foresight, and none that are currently relevant to the metagame benefit from it especially so. The exception is a Darth Maul-led team. In that case you can probably do better than GK anyways. General Kenobi basically wants every stat. Since his skills are so powerful, however, you’re best off focusing on Speed first and then survivability. Look for Protection, Health, and if you have to, Defense bonuses to bulk him up. You can go for crit chance and crit damage on him. I wouldn’t recommend it unless he’s one of the heavy hitters on your team. Even in that case I’d consider not doing it anyways. Crits are heavily penalized in today’s meta and it’d be tough to get GK’s crits up to a noteworthy level. General Kenobi is rather difficult to counter, which is why he pretty much works on every team. That being said, almost every team that is running him is relying on his taunting. Thus, Buff Immunity, dispels, and Shock are all excellent methods to reduce his effectiveness. Beyond that, GK’s burst damage relies on allies being buffed. Having a team-wide dispeller, like B2 or Asajj, means that you can cripple his burst damage. Admittedly his burst damage isn’t why he’s going to be on a team, but it’s something worth watching. Jedi Knight Anakin (JKA) has had quite the roller coaster of a past. He spent a long time being rather lackluster before he received one of the first reworks, catapulting him into the spotlight. Along with Wedge and Lando, he ushered in the AoE crit meta. Since then, however, his use has dropped steadily. It continues to do so, especially with the penalizing anti-crit meta we find ourselves in. Now he’s relegated to a niche use, being a low-ranking option for Jedi teams. Jedi and Clone allies gain 30% Offense and 20% Critical Damage and other allies gain half that amount. Whenever an ally is Evaded, they gain Advantage for 2 turns. Back in the day JKA’s leadership used to be a strong choice. It was one of the more powerful leadership abilities, and more importantly, it was attached to a strong character. Today is not like that. Leadership abilities are almost exclusively useful solely if they manipulate TM , and Anakin’s ability does not do that. It does make for a nice leadership to power through Galactic War, however. JKA still serves a role in the meta, despite being less popular. This role is as a high-damage output Jedi. Since there are better damage options than Anakin, you need to take advantage of his Jedi tag. This means that JKA fits nicely into the QGJ-lead teams. He competes with a lot of other choices for those slots, thanks to only adding damage, but is still a solid choice. When using JKA, make sure to be careful about when using his AoE. Against certain leads, (Rex comes to mind), a poorly timed AoE can be heavily punished. Don’t forget about his Buff Immunity and Healing Immunity! These can be critical in shutting down some opponents. JKA’s simplistic kit means that there aren’t a lot of room for synergies. That being said, there are still some options. JKA crits often. Characters that either increase crit chance or crit damage, like Boba Fett, are great partners. These are high-risk, however, due to the large number of characters that punish crits. Bulky characters that either heal themselves or are healed often are excellent partners. Dropping below 50% health and then healing above 50% will allow for multiple triggers of his unique. This can create a massive damage spike that can swing battles by itself. Crit chance and crit damage are by far and away the best options for Anakin. After that, increasing his Offense and survivability are both great choices. You want Anakin hitting hard and staying on the board as long as possible. Look at getting him a crit chance and crit damage set. Anakin is one of the rare characters that doesn’t need a lot of speed. His unique, along with his typical leader, means that he can get away maximizing his damage output. And you should do that. Anakin is keenly dependent on his AoE damage output to carry his weight, and crits make up a critical portion of that. Either make your characters crit-immune through General Kenobi, Phasma, and the like or look to characters that punish crits. Good examples are Chirrut and Barriss. Besides that, Anakin often relies on his unique to get turns. Shut him down with either Shock or Daze. Darth Maul and Emperor Palpatine are the top options for these debuffs. Grand Master Yoda is the first event character, and unfortunately the weakest. That being said, Yoda still has a place in the competitive arena metagame as a useful support character. Lately his role has been restricted to solely Jedi teams. Jedi allies gain 30% Tenacity, gain 30% Turn Meter whenever they Resist a debuff, and whenever they suffer a debuff they gain Tenacity Up for 1 turn at the end of that turn. Bluntly put, QGJ is still only a relevant character because of his leadership. However, this leadership ability is one of the best leaderships in the meta right now, enough to make an otherwise mediocre character not only viable but a key component of a top-tier team. The speed bonus is crucial. This adds a massive amount of effective TM to your team (or at least your Jedis) and can keep pace with other TM leads like Rex or Darth Maul. The Offense bonus is notable, ending up at ~20% extra damage. As Jedi are rather weak attackers in general, this Offense boost is quite welcome. Finally, the Foresight boon is exceptionally useful as well, particularly against the AI. Automatically dodging attacks is simply fantastic, and regaining it regularly is a great boon. For the most part, Yoda’s purpose is to use Battle Meditation. This is cruicial in providing Jedi teams with Tenacity Up. Jedi teams are particularly reliant on buffs, so debuffs like Buff Immunity and Skill Block are especially bad for them. Further, the extra Foresight really helps. Technically he has other abilities, but oftentimes those can either be more of a detriment or have tiny effects. His basic will get you into a lot of trouble. Thanks to its weak power and the heavy anti-crit & counter-attack meta, you’ll often find yourself regretting his attack. His two other specials aren’t much better. His AoE attack, Masterstroke, is one of the weakest in the game, and while stealing buffs is a neat trick, it rarely coincides with a useful result. Theoretically it should lead into a Battle Meditation. But stealing useful buffs, keeping them, and surviving to spread them is a tall order for yoda (Get it, tall order…). Unstoppable Force has some niche uses. You really are going to use it for the stun. The turn meter reduction isn’t reliable enough between the mediocre proc rate and Yoda’s lower potency. It’s admittedly rather difficult to keep the stun up against the popular cleansers, however. Yoda has some interesting synergies, to say the least. His most obvious use is to protect characters that have weaknesses to debuffs, and to protect fragile characters with frequent Foresight. Since those are hopefully self-evident I’m going to move on. His more interesting synergies are through his other specials. With his AoE he can steal strong buffs which can be an interesting counterplay to Rogue One teams and the like. With unstoppable Force, he can pull off a semi-reliable stun if the target is below 100% health. Normally that means the target is going to die shortly afterwards. However, there are ways to get around this. Emperor Palpatine’s NAME HERE means that all characters will be below 100% health. This allows you to pull off a clutch stun. Speed. Moreso than almost any other Jedi, Yoda relies entirely on his speed to be useful on an arena team. Really his sole job is to provide Battle Meditation as early and as often as possible. After that, if you have a choice, survivability is an okay option. This won’t really do as much, however, as Yoda’s base survivability stats are so low. It’ll be hard to notice the difference. Avoid crit chance like the plague. While you can get a tiny amount of extra damage, it’s not worth triggering the opponent’s anti-crit abilities. Yoda’s damage is so small that it’s a bad trade. Don’t fall into the trap of modding potency. Yoda only has one skill that requires it, and it’s so rarely a factor that it’s not worth the stats. Countering Yoda is unfortunately rather easy. His tiny effective health pool means he doesn’t really stand up to much abuse. Boba Fett’s Execute is an excellent way to snag a quick kill. Just about any amount of AoE spam can often kill Yoda on accident. As may be expected for a Jedi, Yoda is buff-dependent. This means dispellers and Buff Immunity are especially troublesome for Yoda. Look to characters like B2 to give him a hard time. Qui-Gon Jinn is an old character that had fallen out of favor, only to have new life breathed into him between the addition of zeta abilities and new Jedi. QGJ acts a modest attacker with some utility thanks to his dispel ability. His damage used to be potent, but power creep in attacker damage output has killed this. QGJ is now mostly only used for his leadership ability and sometimes for his dispel. Jedi allies have +30 Speed, gain Offense equal to 3 times their Speed, and gain Foresight for 2 turns at the start of each encounter and whenever any unit is defeated. While the correct way to use QGJ in arena is as a leader, he can still find some use in non-top teams. He previously was one of the best available dispellers for F2P players. However, thanks to many new characters being released with dispels and characters like B2 and Sun Fac becoming F2P, this use has faded. That being said, a dispeller is still a key need in arena teams, and QGJ technically does it. If particularly pressed for resources, QGJ is the cheapest dispeller to acquire (especially compared to B2 or Sun Fac) and is simple to gear. He also provides a decent damage boost to the team, whereas most other dispellers are pitiful in damage output. Stating the obvious, but QGJ’s synergies are primarily with other Jedi when acting as a lead. All Jedi benefit from gaining +30 Speed and tons of Foresight. The Offense boost is also nice, though the difference in boost between a slower and faster Jedi is minimal. This means that you should focus on adding the best Jedi to the team, even if their slower speed means they will receive less of an Offense boost. Unfortunately, QGJ only brings a single-target dispel to the board, so that leaves the other four slots on the team to cover the other important roles – damage, cleanse, and taunt. General Kenobi fortunately brings all three of those, and is the true backbone of the team. From there, viable options include Ezra, Jedi Knight Anakin, Yoda, Aayla, and R2D2. Ezra adds another high damage attacker with an additional dispel, something the Jedi desperately need, especially in today’s buff-heavy meta. JKA adds significant damage but not much else. Thanks to the anti-crit meta we are currently in, his use is less than it has been requires careful use. Yoda is a fantastic support character, adding a super-fast Tenacity Up and Foresight, but is especially vulnerable and adds minimal damage output. Aayla is a less popular choice lately, but the stun on her basic alongside her damage output and durability make her a viable option that should not be ignored. R2D2 gets an honorable mention thanks to its ability to boost all of the Jedis’ stats as well as stealth the weaker Jedi. It also helps against Darth Maul teams, a particular weakness of the team. Other lesser choices include common Plug-n-Play (PnP) characters like Darth Nihilus, B2, etc. These characters are less useful for a QGJ team because they do not benefit from the exceptionally powerful leadership. That being said, Yoda and GK can both share some of the benefits with these characters. Speed is king, as always. In a Jedi team, QGJ should not be relied on as a primary source of damage. Instead, he should be expected to provide a dispel when necessary. Once speed has been prioritized, stats such as offense, crit chance, and crit damage are useful. While not the strongest attacker, QGJ at least can act as a secondary source of damage thanks to his stats and leadership ability. I would advise against gearing QGJ for survival. In particular, he’s one of the less useful members on the team. This is because his leadership ability continues even after he is defeated. Furthermore, these survival mods are clutch on more important characters, like General Kenobi and Jedi Knight Anakin..
Rex is an older character that has managed to not only stay relevant but prominent through multiple metas thanks to his excellent leadership ability and cleansing utility. In addition to Squad Discipline and Brothers in Arms, Rex has his basic, Impeding Shot, and Subdue. At first glance, these abilities seem to provide Rex potent damage and offensive utility. However, thanks to his relatively low damage and potency, neither of these abilities end up being particularly impressive in practice. Rex does maintain a base speed of 140, which is just on the cusp of the upper quartile for characters that are relevant in the meta. This is particularly helpful as even if he is Dazed, he can quickly get a turn to cleanse himself. He is not especially durable however, and will likely be the squishiest character on your team. Clone allies gain 20% Max Health, and other allies gain half that amount. In addition, whenever an ally suffers a Critical Hit, all Clone allies gain 15% Turn Meter, and other allies gain half that amount. Rex is one of the top arena leads right now, and for good reason. The meta’s currently infested with characters relying on AoE attacks. Lots of AoE attacks means lots of crits, and Rex converts that into turn meter for his team. Speed is king in arena (and has been for awhile). The handful of leads that compete with Rex (Darth Maul, Darth Vader, Qui Gon Jinn, etc) all have turn manipulation of their own. Rex’s unique strength, however, is that he can provide turn meter to any character. Most of the other popular leads only are able to apply turn meter to characters that share their faction tags. This means that you can, and should, mix and match the best characters underneath a Rex leadership. While Rex is a top-tier lead, he can be used outside the lead role. His utility drops significantly, shifting his role essentially into relying entirely on Squad Discipline to be useful. Still, even relegated to a single ability, Rex is a solid utility character. Ideally you’d want Chirrut or General Kenobi, or one of the passive cleansers, but Rex will do in a pinch. Basically every team needs a cleanse, and thanks to Rex’s leadership, Rex works with well with just about every other character. That being said, Rex still has certain weaknesses that need to be covered. Rex’s relative squishiness means you should have at least one strong tank, preferably two. The standard tanks apply here: Baze, General Kenobi, Shoretrooper, Stormtrooper Han. His lack of damage output means that the other characters on your team will need to make up the difference as well. He pairs well with attackers that rely heavily on their special abilities to be useful, such as Darth Nihilus, Boba Fett or Rey. They’ll appreciate being kept free of debuffs (especially ability block). Rex is one of the easier characters mod, if only because he has few useful stats. Roughly, the stats you should be looking for are health, protection, speed, and (if you can get a lot of it) tenacity. For sets, ideally I’d suggest 4x Speed and 2x Health. You can substitute 2x Tenacity, but only if you’re able to stack it to a significant number. Star Wars Galaxy of Heroes Rex Lead Arena Without Chaze? I have two questions that I’m interested in answering here. What is the best alternative Rex-led arena team to the staple Rex/GK/Chaze/zDN (tri-clean)? How far is that team behind the staple? Characters worth discussing I think include Kylo, R2D2, EP, Boba, B2, and DN. Assume all relevant zetas. I think the “core” is Rex/GK. DN is removable, but would require quite the compelling argument to yank. R2D2 is the new flavor of the month and is a character with a lot of staying power. It’s even a viable option to replace DN in triple-cleanse. But I have concerns about it in the alternative team. Burning is a great debuff, but the team to beat is tri-clean, not Maul. Admittedly Maul + EP + DN chaining their AoEs can give Rex teams trouble if they’re lucky, but I don’t think R2 drastically improves that scenario. R2 also has notable synergy with other light-side characters, yet none of the other options are light-side, reducing effectiveness compared to slotting into tri-clean. Yes, R2 can work even with DN/DM teams so this isn’t a serious issue, but R2’s place in those teams is to help them with other DN/DM teams. B2 is an old staple, but I think its time is finally fading. It is a stellar option against zQGJ and should be brought in against those teams, but I think its usefulness otherwise is limited. I currently put B2 in against tri-clean. This option has proved to have mixed results. Its AoE dispel does wonders, of course. But its frequent piddling basic attacks trigger HoTs, TM gain, counter-attacks, and crit-immunity. Considering how much the tri-cleanse team and DM teams get from these weak attacks makes me question B2’s value. DN has been replaced by the R2 as the cool new character to run, but is still quite a popular and powerful option. He’s less consistent than I would like, especially against tri-clean. More than one match I’ve had a pitiful Drain Force followed by a Deflected Ceaseless Craving and then he dies the turn before Annihilating. Of course, DN is still quite a powerful character, so removing him from the squad is unlikely. There’s a good reason he’s seen on nearly all the current top meta teams. He is somewhat reliant on allies providing debuffs, however. Boba has largely been eclipsed by DN, and while I agree with that being the right choice, I think it is somewhat unfair. He still has merit in being able to snipe down weak characters (Chirrut, Yoda, etc) much faster than DN could dream of, and has a lot of self-recovery. DN is still the better choice in most situations, but I think there’s possibility of running both, as long as you’re careful not to waste both of their AoE skill blocks at the same time. EP causes mixed thoughts for me. He seems like a gambler’s favorite. When he hits gold and stuns all five characters on the other team he’s fantastic. When he stuns no one and dies to a stiff breeze immediately afterwards I question gearing him. Really what keeps him relevant is his Shock and his AoE stun. Shock is primarily useful again Maul, and while it is quite useful in that matchup, it doesn’t grant the same benefit in others. EP is one of the characters I see as most replaceable. Kylo is the only one on this list that I don’t personally have. From what I’ve seen he can certainly do impressive amounts of damage. He has a nice ability to win 1v2s and even some 1v3s. When played intelligently his stun and impressive damage is quite the asset. I’m concerned with his capabilities on defense. He doesn’t seem to do much of anything when used by the AI unless uncommon instances cause him to shine. I’m leaning towards Rex / GK / DN / Kylo / R2, but I’m concerned about a lack of debuffs for DN as well as the AIs for Kylo and R2. What are your thoughts? Plants vs Zombies Heroes Super Brainz Deck – Giftymas! Since I’ve reached Ultimate League awhile ago, I want to share my Super Brainz deck that got me there – Giftymas. Before I get started, I want to give a big shout-out to TryHard who came up with the deck I based this one off of found here. 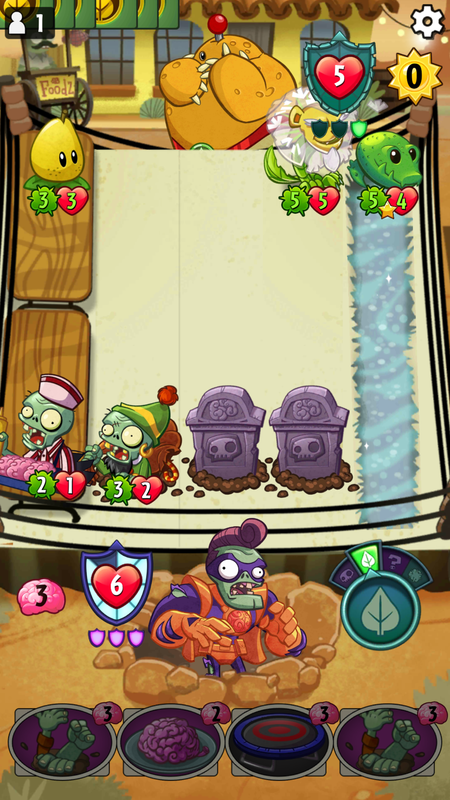 I knew that Regifting Zombie had a lot of potential, but was struggling to put it work, and TryHard figured it out first. You should go read that guide, because it covers a lot of the basics in excellent ways and there’s no sense in re-inventing the wheel here. Instead, I’m going to talk about my changes, both in playstyle and in cards. A flaw I found in the original deck is that it doesn’t commit well to a strategy, and instead straddles the line awkwardly between aggro and tempo. This deck runs out of gas too easily to be an effective tempo deck. Another issue I ran into is that while the max hand-size gimmick was great at lower levels, once I crossed 40ish it stopped working basically ever. It also got run over hard by mushroom decks and struggled with tempo decks (especially Grass Knuckles). At the time, however, TryHard was running 4x Headstone Carver, which they have since dropped for 4x Fire Rooster. I kept both cards. You are playing an aggro deck, and should push to have a hand as close to the above as possible. If you’re playing against an opponent that runs mushrooms, cycle for a Fire Rooster (preferable) or a Line Dancing Zombie. When playing against Rose, replace the Headstone Carver (but play it if you get it), and focus instead on making sure that your T4 and T5 plays are as close to perfect as possible. If your hand is bad, keep Regifting Zombies in the hope that you draw better cards. Make sure your Pogo Bouncers survive. Getting a second use out of them from the Mixed-Up Gravedigger is a huge swing in the game. They are the best zombie to re-activate with the Gravedigger. Do it every time you can. A lot of your games will end on turn 5 or 6, thanks to the above rush being incredibly difficult to answer. 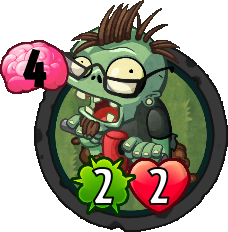 Bouncing a plant on turn 4 & 5 and spending 8 Brains on turn 5 is such a huge boost that most other decks won’t be able to recover, let alone stabilize. If your opponent is still somehow in the game, you have exceptional finishing power. Look to use some combination of Strikethrough (Line Dancing Zombie), bonus attacks (Lurch for Lunch and Electrician), and bounce (Pogo Zombie and Backyard Bounce). Now with those basics in mind, let’s go over the card changes I’ve made. As a nice bonus, my changes remove 4 Super Rares and 2 Rares, replacing them with 6 Commons. This converts the deck into an excellent new player-friendly deck. This is going to be the most controversial change, so I’ll address it first. Simply put, this card has no place in this deck. Which is strange, of course, as Teleport is one of the best cards in the game. More often than not, I would find myself cycling away the Teleports for the card draw and tried to figure out why that was. 1) Teleport is not a card in your ideal hand, nor does it help you with any of your weaknesses. You want to be playing on-curve (in other words, using all your Brains) every turn, especially against your weaker match-ups, and Teleport slows that down. 2) Teleport does not play well with Mixed-Up Gravedigger. 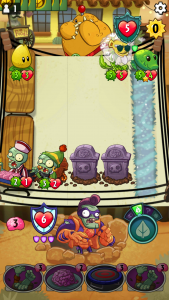 Teleport is used to get zombies on the board without the Plant player being able to respond, but the Gravedigger does that automatically anyways and doesn’t trigger anti-Trick effects. Often times I would run into problems where I’d have every lane filled and wishing it was a Lurch or a Backyard Bounce to go for a kill. Another issue is that you just don’t really have anything scary to teleport in – almost all of your zombies are Gravestones. This gives your opponent an extra turn to block them, which is never good for aggro. Your toughest zombie, Gravedigger, you would rather play normally so your opponent can’t use tricks on your zombies. 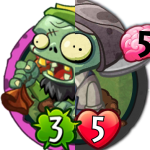 I’m sorry, but as much as I love pirate zombies, this guy just doesn’t cut it. He’s too slow to really be an effective aggro card, and is anti-synergistic with the Gravedigger. He trades exceptionally poorly, and is a dead-drop outside the early turns. Leaving him in over-burdens your 2-drops as well. Almost every time I played this card, another Backyard Bounce would have been just as effective. Furthermore, a 7-cost card in an aggro deck should do a lot more than this. These are kept in to preserve a semblance of a Brains curve. If you’re reading this in the future, this is one of the first cards you should replace, but it should be replaced with another 1-drop. Frankly it only keeps its spot because there isn’t a better 1-drop available, and you have too many 2-drops already. For some reason he draws a lot of removal (more than he should, imo). This opens up the chances of your Electricians and Pogo Bouncers surviving, which is exactly what you want. I found this cards was winning me an absurd amount of games (or closing games out a turn or two early, potentially winning me many more). I asked myself why I didn’t play 4 of it instead, and when I couldn’t come up with an answer, fixed it. In an ideal hand, this allows you to make three attacks with the Mixed-Up Gravedigger on Turn 5 (Lurch, Electrician, normal), which is a nice 15 damage burst. I was desperate at first to find another mid-range drop for this deck that worked well with Gravedigger, and added this one with a bit of reluctance (I actually tried Tomb Raiser and Mad Chemist first). Don’t make that same mistake. Electrician is absurdly excellent in this deck. Not only is it a solid drop by itself (4 damage for 3 brains trades with a lot of threats), but it synergizes excellently with the number of high-power zombies you have, and fires off again when buried by the Gravedigger. TryHard mentioned that you should play Brain Vendor pretty much whenever you can. I strongly disagree – instead, pair the Vendor with the Gravedigger whenever you can, and never play the Vendor otherwise unless you’re nearing death. Keep Pogo Bouncers alive. It’s worth mentioning twice. Whenever you have all of your lanes filled with zombies, consider letting one of them die. Opening up a lane to drop a Mixed-Up Gravedigger on the next turn is almost always worth it. Taking damage is great, because it gives you more cards to win with, and with your Fire Rooster & Line Dancing Zombie, it is rare that a plant hero can effectively rush you down. 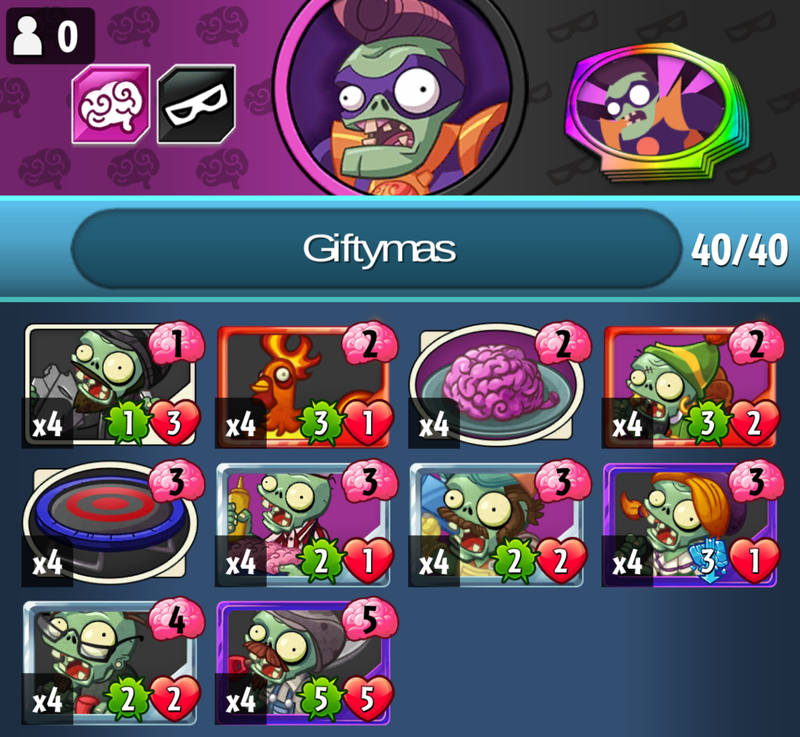 And that wraps up my Super Brainz deck, Giftymas. What did you think? Are there cards are should run instead? Have you tried something similar?